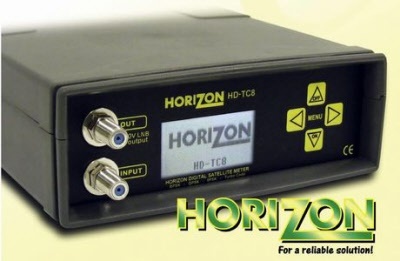 The Horizon HD-TC8 is the latest generation meter for the Global uptake of VSAT installations, measuring BPSK / QPSK / 8PSK, DigiCipher II and Turbo Code formats. Specifically designed for the “Tooway internet service on Hotbird 13E KA band”. Designed with a generous storage of up to 256 transponders, including the flexibility of 16 user customisable selections for onsite unique carriers. 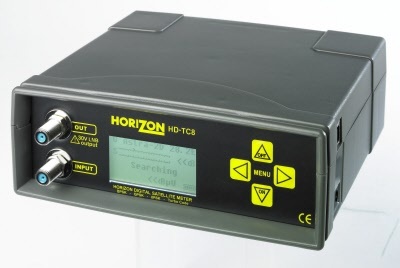 The transmission signals can be isolated with this precise and accurate installation tuner, reducing the time to detect the downlink path and hence frustration in the often challenging environments of VSAT use. This meter will not work on the NEW Eutelsat Tooway services on Ka-SAT 9 Degrees East. The all new HD-TC8 is the latest generation meter for the Global uptake of VSAT installations, measuring BPSK / QPSK / 8PSK, DigiCipher II and Turbo Code formats. Specifically designed for the new “Tooway internet service on Hotbird 13E KA band”. As with this type of system, battery supply is important for field and remote locations, so this Meter comes built with a long life high-output Lithium-Polymer rechargeable battery pack, supplying 15V DC at 2400mAh, capable of providing more than 6 hours continuous run time. Horizon’s menu template of “keep it clear and simple” has continued with this meter, to include features such as Spectrum, Constellation Diagrams, Bit Error analysis, Carrier-to Noise and true MER expressed in dB, all in an intuitive and easy to use format. The HD-TC8 comes as a complete kit with mains charger, car charger and USB cable for data transfer and satellite settings update from our website. Support and downloads for the HD-TC8 are available via a dedicated website. No internet registration is required, charge your meter and you are ready to go. ** Ka-Sat has no direct meter solution due to the exotic ODU (OutDoor Unit) hardware (which would require a 35 Volt power supply and a 1GHz upconvertor to enable our HD-S2 meter to see the signal). Swapping out the ODU for a weighted Universal LNB assembly to line up on the co-located Eurobird-9A (also at 9° east) is the only option they have available.